While English painting in the Victorian era encompassed a huge diversity of styles and subjects, public taste very often favoured nostalgic and sentimental subjects, such as children, the elderly, countryside scenes or couples in love. 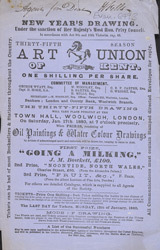 The Art Union of Kent is here advertising a lottery to increase its membership: for a small sum the subscriber could win a watercolour or oil painting. The first prize is a painting titled 'Going A Milking', by JM Bowkett.